Our special music is “Annie’s Song”, composed and performed by Drew Faulkner, a student at Northwestern Oklahoma State University. Piano and orchestration arranged and performed by Ken Sarkey, and recorded at Cornerstone Recording Co., Edmond, Oklahoma. A number of guests were Interviewed in this episode; some we hear from briefly now, but will hear more of their account in upcoming episodes. Sergeant – Edmond Oklahoma Police Dept., formerly with the FBI and Bomb Squad Member, she was a College Student in 1995. Assistant Fire Chief – Oklahoma City Fire Dept. Formerly with the Oklahoma City Police Dept. Director, Oklahoma State Emergency Management. While working on the first episode of our Real Mysteries podcast series, “Annie’s Song” came to mind as I considered music appropriate for inclusion. It was written in 2013 by a then 20 year old Drew Faulkner, who sent me a demo to listen to and help him with a professional arrangement and recording. I had previously had the pleasure of recording Drew’s beautiful singing voice, and he comes from a very talented and creative musical family. On the very day we released the premier “We Will Always Remember” podcast that closed with “Annie’s Song”, Drew’s father was recovering from cancer surgery in Oklahoma City, and my wife and I played it for him during our visit to the hospital that evening. On April 19, 1995, in an instant, the walls of the Murrah federal building were shaken apart, along with the lives of those inside, and those who would rush to their rescue and recovery. It would require a lot of strength to work through the healing process; physically, mentally, and emotionally. It takes time, too. We are coming up on the mark of twenty years since that horrific event, and as we have interviewed many who were involved first hand, we see and feel those emotions still lingering. We pray for continued restoration as you cast all your cares on the One who cares for you. I began writing “Annie’s Song” in the spring of 2013 and wasn’t satisfied with it until that fall. It was at that time that I contacted Ken Sarkey at Cornerstone Recording Co. in Edmond, Oklahoma, to see about arranging and producing the song. He worked on it for months. He would send me a version of the song, and I would give him any ideas I had for adjustments via email. We corresponded that way until the summer of 2014, when he sent me the final product. I was blown away when I listened to it for the first time. The inspiration for “Annie’s Song” came from the mother of one of my friends. At the time, she was battling cancer, and her case was not a good one. However, she’d decided she was going to be positive, and would post about her daily life on Facebook to encourage people. One of these posts not only sparked my imagination and inspired me to write a song, but also struck me to the core and changed me forever. It wasn’t the post itself, but a comment that caused this epiphany. Person after person had commented with words of encouragement, which is crucial in a situation such as hers. However, she had learned something even more important than believing she would beat cancer, and I was about to discover it in one of her replies. I can’t remember what her exact words were, but I can tell you what I took away from it. From what she said, I got, “I might not survive this, but God is still good even if I don’t.” When I processed what she said, my jaw dropped. It was at this moment that I discovered what true faith looks like. True faith doesn’t depend on outcomes to be strong, it just IS. True faith believes that God IS good, no matter what your eyes see, or what your mind, or sometimes even your heart, tries to tell you. It was then that I began to imagine what she thought, said, or felt when nobody was around. I started to try to picture the dark battles she had to fight against herself: against any fear, pain, sorrow, doubt, anger, hatred, or even self-resentment. I imagined that huge war, and all of the weariness that must come with it. And then I thought about the reality of her victory. She was not cancer free, and didn’t know yet what would happen to her in the end, but when she decided to have unconditional faith, she had already won. When she could have given in to fear, she decided instead to acknowledge the reality of what she was facing and be an encouragement to others in the middle of it all. Even if it turned out that she wasn’t going to be around for much longer, she decided that she was going to use the time that God gave to her; that while she was still alive, she was going to live. Editor of Oklahoma City Gazette, Writer of “The McVeigh Letters” article for Esquire magazine. Oklahoma City Police Department (ret). From the briefing broadcast on April 19, 1995. 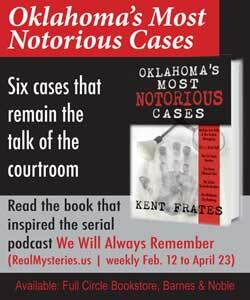 Oklahoma City attorney and author of “Oklahoma’s Most Notorious Cases”. Former US Attorney General. From the briefings given April 19-21, 1995. Oklahoma County Assistant District Attorney, lead prosecutor in the State of Oklahoma vs Terry Nichols trial. Former Oklahoma County District Attorney. David Cid is a founding partner in Praxis LLC, providing critical incident management and security consultation to corporate leadership. He is also Director of the Homeland Security Institute at Rose State College, developing a series of college level Counterterrorism courses. From 2006 to 2014 he was Executive Director of the Memorial Institute for the Prevention of Terrorism, a nonprofit training and professional development center serving the line officer. The police training program developed by Mr. Cid has been used by over 450 agencies nationwide, to include the NYPD. Prior to joining the Institute in 2006 as Deputy Director, Mr. Cid was President of Salus International, a consulting practice providing Security, Crisis Management, and Business Continuity services. Clients included the United States Army, the FBI, the Department of State, and Fortune 500 companies. For two years, he was an advisor to foreign governments on counterterrorism in Europe, Asia, Africa, and Latin America. Mr. Cid is a 20-year veteran of the FBI, where he served as a counterterrorism specialist. He was a member of the FBI International Crisis Response Team, and while assigned to the New York field office, a member of the FBI Special Weapons and Tactics team. Mr. Cid has been on-scene commander in extortions, kidnappings, and acts of terrorism and has led special events security planning for the World Series, the Special Olympics, and the U.S. Open. In 1996, he supervised the first successful investigation and prosecution under the Biological Weapons Antiterrorism Act, interdicting a plot to assassinate federal and local officials. A native of New York, Mr. Cid joined the FBI in 1981, retiring as an Inspector and Assistant Special Agent in Charge of the Oklahoma City Field Office. Prior to his FBI service, he was a Human Resources specialist for AT&T. He is a veteran of the Vietnam War, honorably discharged. Recent publications include “Understanding Counterterrorism A Guide for Law Enforcement, Policy Makers and Media,” available on Amazon.